I'm a seafood lover and I thank God that I live in a country with rich waters. I can eat tuna raw, I prefer shrimp either in sinigang or sauteed in garlic butter, and I love eating crab meat and its cholesterol-inducing fat. One fine afternoon, together with Donna, Leo and Yummie, we are on a see-food mission! We are introduced to Davao's pride - the homegrown casual-dining seafood restaurant Blue Posts Boiling Crabs & Shrimps. The interiors of Blue Posts Boiling is inspired by a fisherman's wharf, which exudes a warm, rustic feel. The SM North EDSA The Block branch has a little touch of modernity. 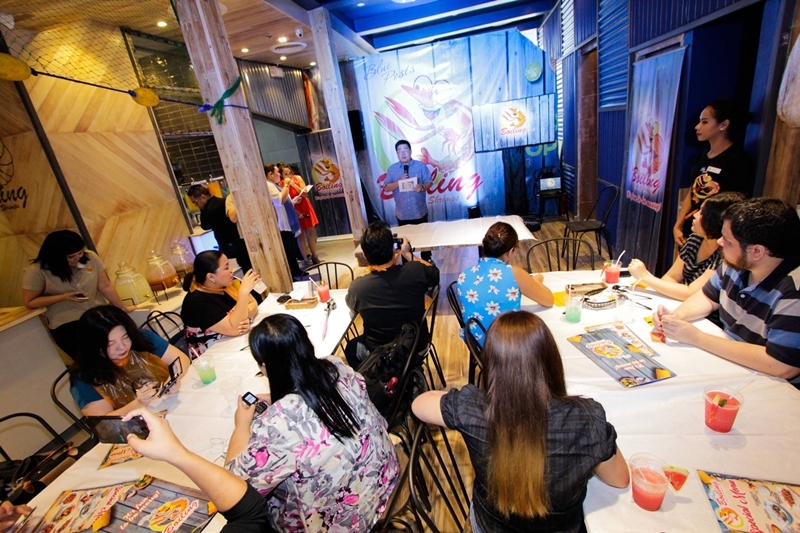 It has three long tables, a couple of booth-type seats and some tables good for solo eaters or couples. It can probably seat around 40-50 people inside during peak hours. The cashier and kitchen located on the left side while the wash area and restroom is on the right. The owners were introduced to the seafood-by-the-bag concept from one of their US trips. 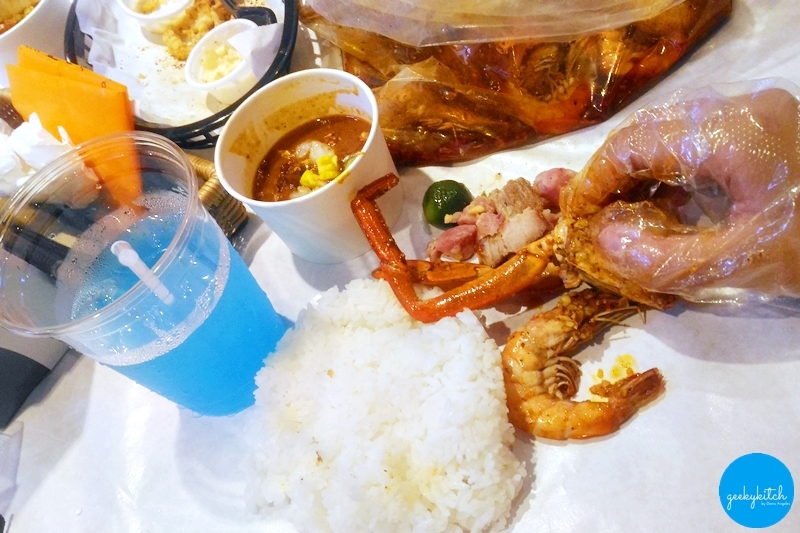 People would line up for hours at these casual dining seafood restaurants and one caught their eye, boasting a "messy finger-licking" dining similar to our very own "kamay-kainan". 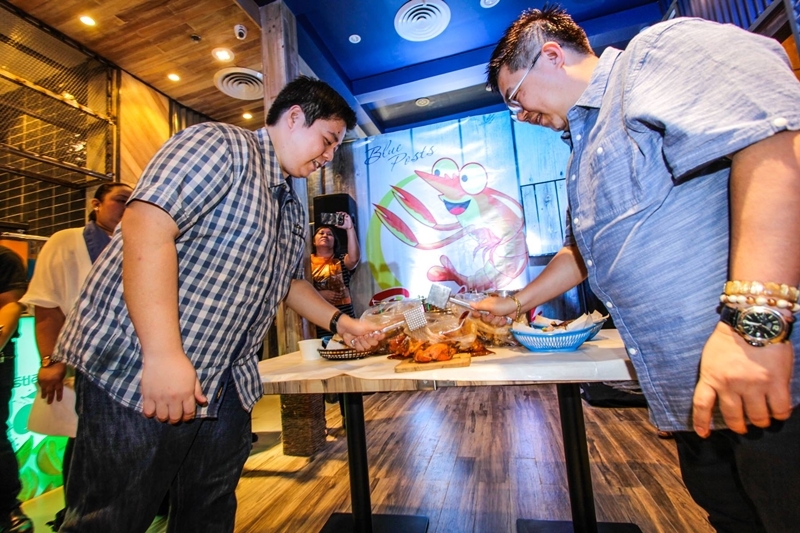 This became the inspiration behind the rebranding of Blue Posts Boiling Crabs & Shrimps in 2013. 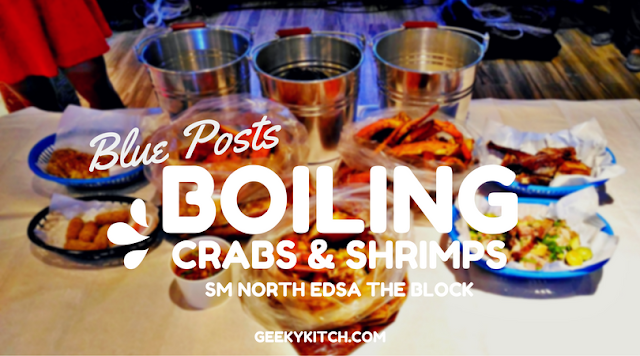 So how do you get started on your messy gastronomic adventure at Blue Posts Boiling? 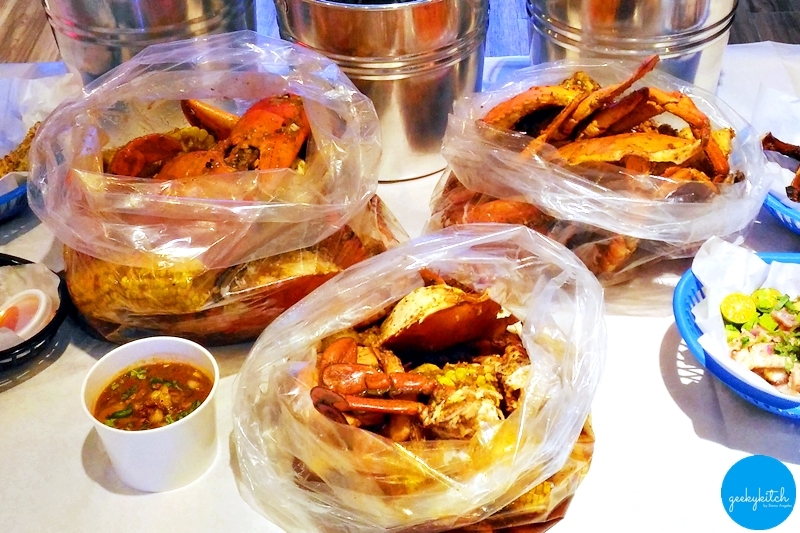 Choose your catch (crabs, shrimps, mussels), how you want them cooked (Blue Posts Boil, Garlic Fried, Sambal), and the spice level (regular, mild, hot and spicy). Some sausages, boiled potatoes and corn cobs are tossed in the mix. 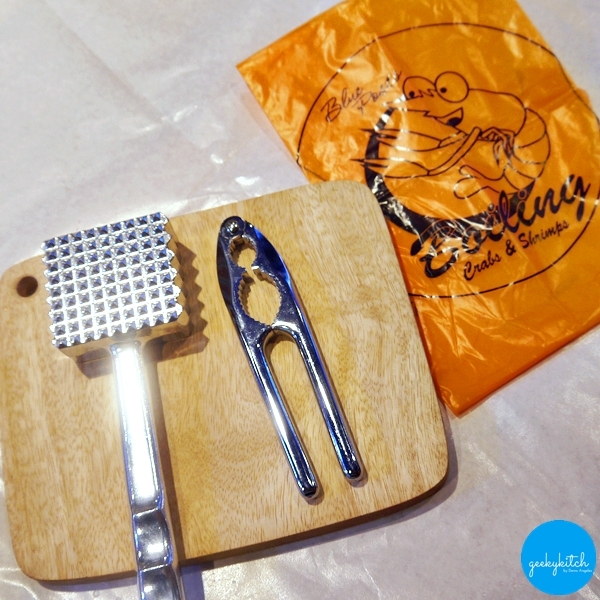 Everything is cooked within a food-grade boiling bag which ensures that the food is juicy (because moisture is trapped in) and the natural flavors are absorbed by the meat. Your messy eating companions! Hammertime! 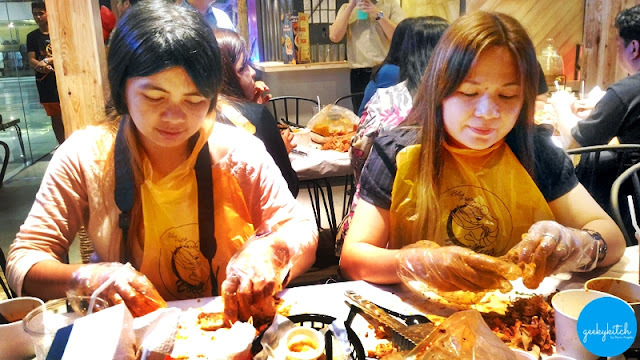 Put away your phone, wash your hands, then get your bib and gloves on! The staff puts food-grade wax paper on our table and brings out the hot and piping food. It's time to get messy! 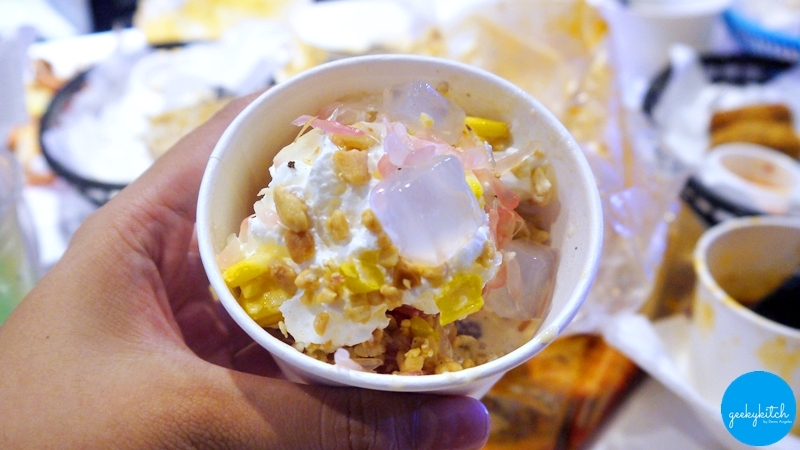 We recommend that you put the rice on the wax paper to keep it warm a little longer. Get some of the sauce from the bag along with your seafood and pour it over your rice. 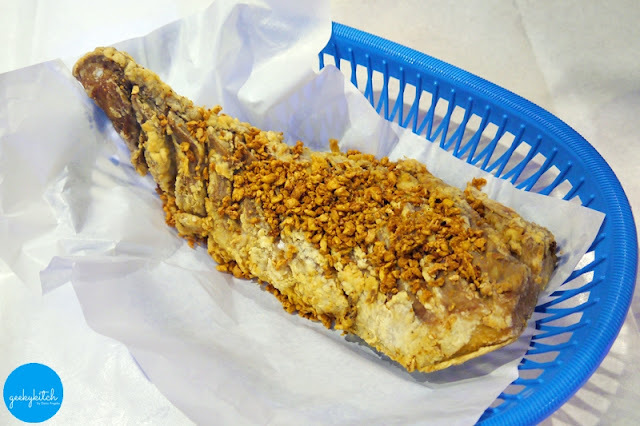 Mangaon na ta! 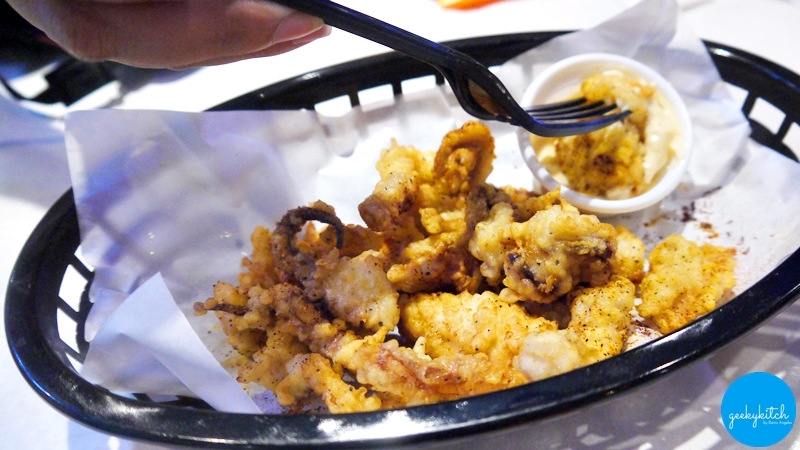 While you wait though, feast on some crispy Calamares (P237) that comes with a creamy mayo dip (1 cup is not enough!). 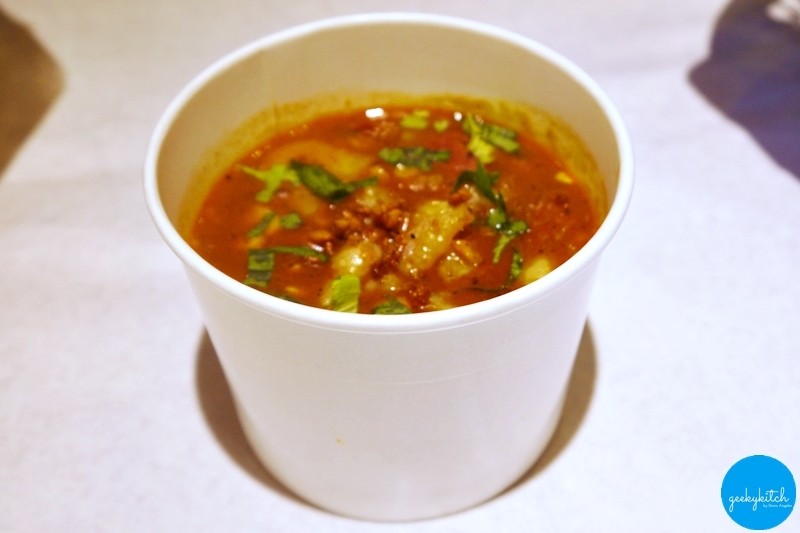 Warm your belly up with a bowl of Spicy Gumbo Soup (P189), a mix of fresh seafood and vegetables in a rich broth of Cajun spices. 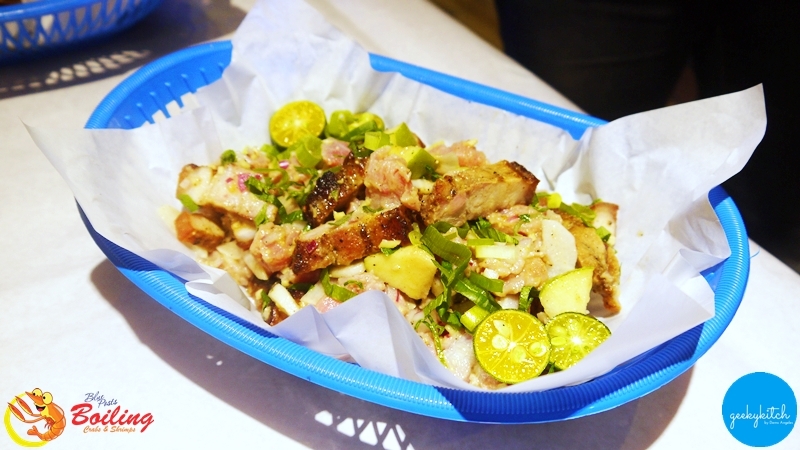 We love their Sinuglaw (P179) that comes with green apple slices and can't get enough of the freshness of their Crispy Garlic Tuna Belly (P429) that's loaded with garlic! 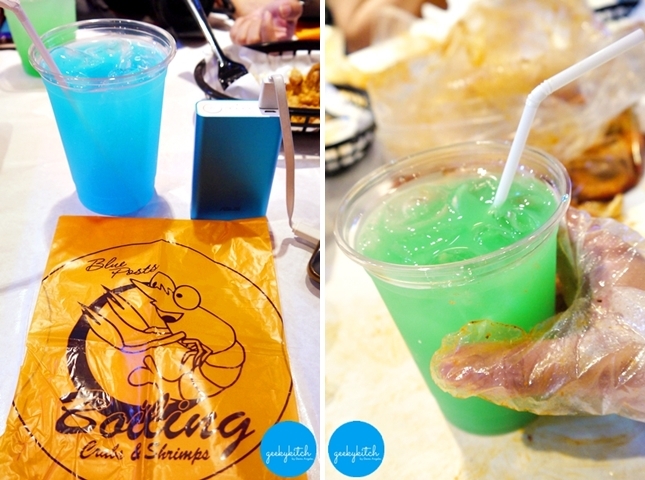 For drinks, I'm personally happy with Blue Lemonade in itself. But if you want something unique, Blue Posts Boiling has a mixology section where you can mix different juice drinks (similar to Family Mart's): Pine-O (pineapple + orange), Lime Cooler (pineapple + blue lemonade), Four Seasons (red tea + orange), Purple Brew (pink lemonade + blue lemonade), Berry Guava (red tea + pink lemonade), Citrus Dew (cucumber lemonade + blue lemonade), Fruit Burst (cucumber lemonade + pink lemonade), and Tropical Kick (red tea + pineapple).